Convergence: the act, condition, quality or fact of converging. It’s what came to mind when I clicked on Julia’s Blog, Defeat Despair last week. In late December our family ventured to San Francisco in what could best be described as a bust. Mike had the week off and wanted to go somewhere with our boys. We rode the train, then a trolley followed by a long walk, only to find a line wrapped around the building of the site we had come to see: the renovated Exploratorium. It was a big let down, though not unexpected when you live in a large, metropolitan area. Whatever you thought to do, it seems thousands of others had the same idea. As we were leaving the City, we stopped in to see the holiday decorations on display at the Hyatt Regency, then exited into a courtyard filled with cyclamen. I took several pictures before we headed home, and planned to blog about them the following week. When I clicked on Julia’s blog I felt that odd sense of deja vu. Her post “Actually See” featured her cyclamen photo, taken a decade earlier in the same neighborhood of San Francisco. Convergence. Julia lives in another state. We connected through a fellow blogger living in Canada. Yet here she was posting cyclamens from 2004 that seem to mirror my own the week before. 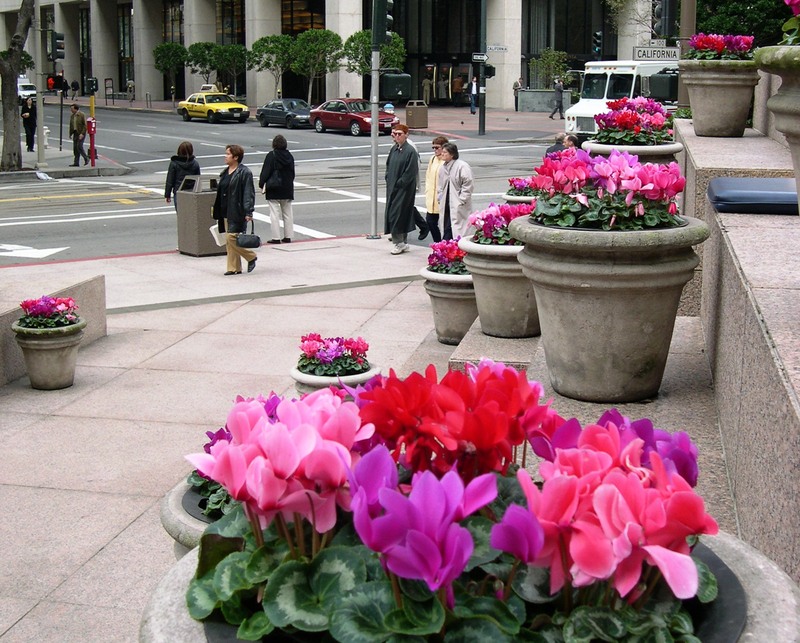 This entry was posted in Community and tagged convergence, cyclamen, Defeat Despair, flowers, Hyatt Hotel, San Francisco, San Francisco Cyclamen, San Francisco financial district. Bookmark the permalink. Wow, so much about this post makes me happy! I’m happy they still have the cyclamen blooming in the city, making winters beautiful. Super happy that the always wonderful Exploratorium has had a makeover (although I’m sorry you were crowded out on the day you went 😦 ) And those gorgeous photos made me happy too, especially the close up ones! I am also happy you thought of me in this post. Convergence! A shame you missed the event you intended to see but I imagine a city like San Francisco is a candy jar of Christmas wonder everywhere you look. Your photo’s turned out so nice. I love all the festive colour and even more because it’s not the usually red, white and green. With their petals up, they always remind me of butterflies that have stopped to sit for a bit. Synchronicity happens to me all the time – things meaningfully but not causally connected. It is reassuring to me when it happens. Like a cosmic joke, reminder, that forces bigger than me, more magical and mysterious are at work in my life. I feel when it happens that good is in my life despite my errors, flaws, misgivings, meanderings, redirections…Your description of convergence I had never thought of but I like it! And I love your beautiful and colorful photos! This time of year, in the high desert of central Oregon, there is little green, mostly tones of brown. By March we are hungry for color and venture to other parts where spring is making lovely show we will not see until May or June! Thank you for sharing your view of the world, Alys!! Lovely photos and very nice post. And yes … several times, I have found that I posted a photo very similar to a photo that another had posted. Certainly not with the connections that you have found, but cool none the less. Nope, I can’t say I’ve ever experienced it or least remember experiencing it – have a wonderful weekend. The flowers are beautiful. Isn’t it funny how life has it’s own agenda? Glad you all had a good time in spite of the change in plans and I’m intrigued by the Convergence. Food for thought. I’m trying to send some rain your way. Thanks for the good rain karma. I’ll take it. Cyclamen are stunning flowers. They have such a rich color and interesting way of unfolding. I often think of them as bent in half, then lifting up as if finishing a bow. 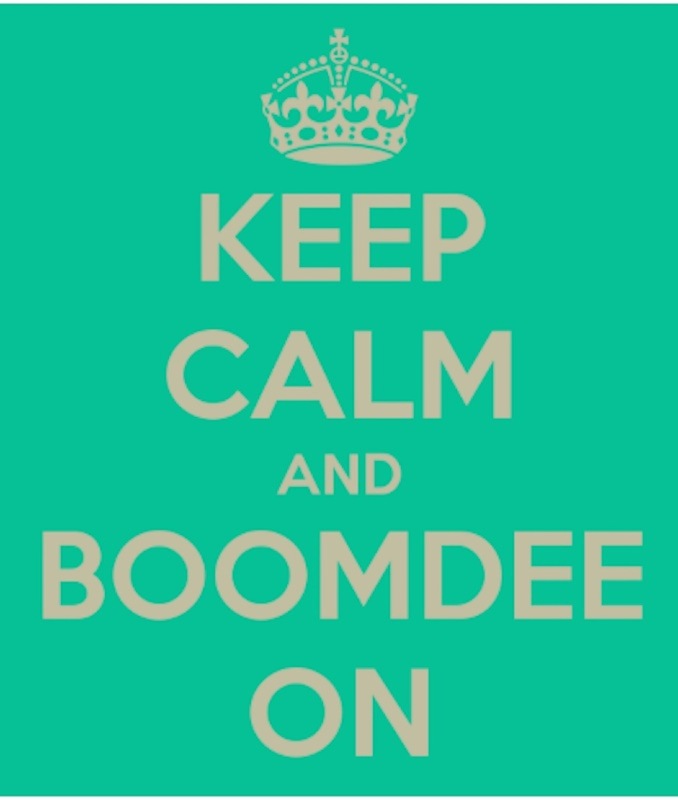 I love John Lennon’s famous quote: “Life is what happens while you are busy making other plans.” Indeed. I hope you are well, Marlene. I think perhaps I’ve missed your recent post.